Are Exoplanets Orbiting Red Dwarf Stars too Dry for Life? In this artist's conception, gas and dust swirl around a young star. Eventually this material should form planets through gravitational accretion. If water is the source of life, then finding the source of water certainly qualifies as a worthy astrobiological endeavor. Scientists have formulated certain scenarios for how our planet became wet and stayed wet, but other planets may not have been able to tap this same source. One place where water availability could be a problem is around low-mass stars. The class of M dwarf stars— which weigh between 10 and 50 percent the mass of our sun — are the most common stars in our galaxy. A recent analysis of data from NASA's Kepler spacecraft showed that six percent of these red dwarf starslikely have habitable Earth-size planets. Habitability in this case is defined by surface temperatures that are conducive to liquid water. But what if there is no water there to begin with? Indeed, previous research using computer simulations suggested that planets near M dwarfs might be devoid of water. "These earlier papers definitely had an impact," Ciesla said. "They set the stage for current thinking for formation of planets." An artist's depiction of a planet around an M dwarf star. But Ciesla believes the problem should be looked at anew. Recent understanding about the formation of our solar system suggests that the source of planetary water is a complicated business that depends on the environment that the central star is born in. This could change the prognosis for water around M dwarfs. Ciesla has funding from NASA’s Exobiology and Evolutionary Biology Program to re-explore the watery potential of small star planets. The way that water is generally thought to have arrived on Earth is by hitching a ride on space rocks and grains. Early in our solar system's history, these rocks and grains were spread out in a large disk rotating around the sun. The material in the inner part of the disk was generally too warm to hold water, but rocks and grains beyond the so-called "frost line" at around 2.5 times the Earth-sun distance (which is 93 million miles, or 150 million kilometers) were cold enough to collect ice crystals. Could a similar process play out around other stars with less mass? In 2007, two separate research groups looked at this question. On computers, they basically re-did the planet-formation recipe but with half the ingredients. The results were disappointing for water enthusiasts. Planets in the habitable zone around M dwarf stars are dry, according to these models. 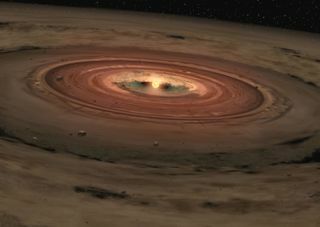 One of the reasons for this lack of water is that M dwarfs start out with smaller planetary disks. Researchers found that smaller disks have fewer gravitational interactions and therefore are less efficient at driving ice-carrying material into the inner disk region. Another knock against low-mass stars is that they are brighter when they are younger. This pushes the frost line farther out relative to the eventual habitable zone. "It becomes even harder to bring in water-bearing material when it starts so far out," Ciesla explained. These are all sound arguments, based on a scaling down of our solar system, Ciesla said. But he wonders if something more than size differentiates our solar system from that of an M dwarf system. The difference, he thinks, may be aluminum. Aluminum, in particular the isotope aluminum-26, may have played an important role in the delivery of water to the Earth. Aluminum-26 is a radioactive isotope with a half-life of 700,000 years. Evidence from meteorites suggests that they — and the parent asteroids that they came from — once contained a significant amount of aluminum-26, which decayed long ago during the era of planet formation. The decay of aluminum-26 likely had a major impact on the large space rocks, called planetesimals, that eventually glommed together to make planets. These mountain-sized planetesimals trapped the heat from aluminum-26 decays, and that heat would have melted ice carried by the planetesimal. Some of the ice-melted water would have reacted with the rock (producing the hydrated mineralsfound on many meteorites). But some of the water would have been lost to space. If this story is right, then aluminum "cooking" robbed Earth and the other terrestrial planets of some water and other volatiles that were destined for delivery. But this is not a general rule of planetary formation. "Not every planetary system is going to have aluminum-26," Ciesla said. Aluminum-26 is made in massive stars. It's not entirely clear how our solar system got so much of it, but it likely came from a nearby supernova or stellar wind. Another planetary system may have had no such source for aluminum-26, so its planetesimals may have kept more of their water throughout the planet formation process. Using sophisticated computer simulations, Ciesla is currently testing whether this extra water might make a difference around low-mass stars. He admits that there may be other effects that cancel out the influence of the wetter ingredients. "It could be two steps forward, two steps back," Ciesla said. Sean Raymond, who worked on one of the earlier studies of planets around M dwarfs, agrees that the previous conclusions are outdated. In the outer regions of the solar system — beyond an invisible boundary called the "frost line" — it was cold enough for lightweight volatiles such as water and ammonia to condense onto the nascent giant planets. Thus, the outer planets formed from not only rocks and metals, but collected volatiles to become gassy giants. In the relatively warm inner region, the smaller planets Mercury, Venus, Earth, and Mars formed mainly from rocks and metals. He says other researchers have looked at the effects of aluminum-26, but he thinks Ciesla may be the first to take into account the increased mass of water-rich planetesimals and how that might increase gravitational interactions. "I definitely think that if planetesimals around low-mass stars were wetter, then the planets that form would also be wetter, presumably wet enough for life," Raymond said. However, he and others have developed a new model for our solar system that seems to solve water delivery and other problems in planet formation research – without a role for aluminum. This so-called Grand Tack model assumes that early on Jupiter crept inward toward the sun but was yanked back outward when Saturn formed. This migration of the gas giants presumably helped drive water-rich material toward the inner solar system where Earth and the other terrestrial planets were forming. "If the formation of planets around low-mass stars includes migration, then water is also naturally delivered to Earth-like planets," Raymond said. "So, the idea that water delivery is a big problem for these planets is probably overstated." In fact, there may be an abundance of water for these planets. If Ciesla is right about the effects of aluminum-26 and Raymond is right about migration, then we might expect many exoplanets to be "water worlds," Raymond said. If so, then future missions, such as NASA's James Webb Space Telescope, might be able to spot water molecules in the atmospheres of some of these distant planets. That would give us a clearer understanding of the source for planetary water. This story was provided by Astrobiology Magazine, a web-based publication sponsored by the NASA astrobiology program.Follow us @Spacedotcom, Facebook or Google+. Published on SPACE.com.